Download "Regulations for the Novartis Direct Share Purchase Plan"
5 3 Regulations for the Novartis Direct Share Purchase Plan 1 What is the Novartis Direct Share Purchase Plan? 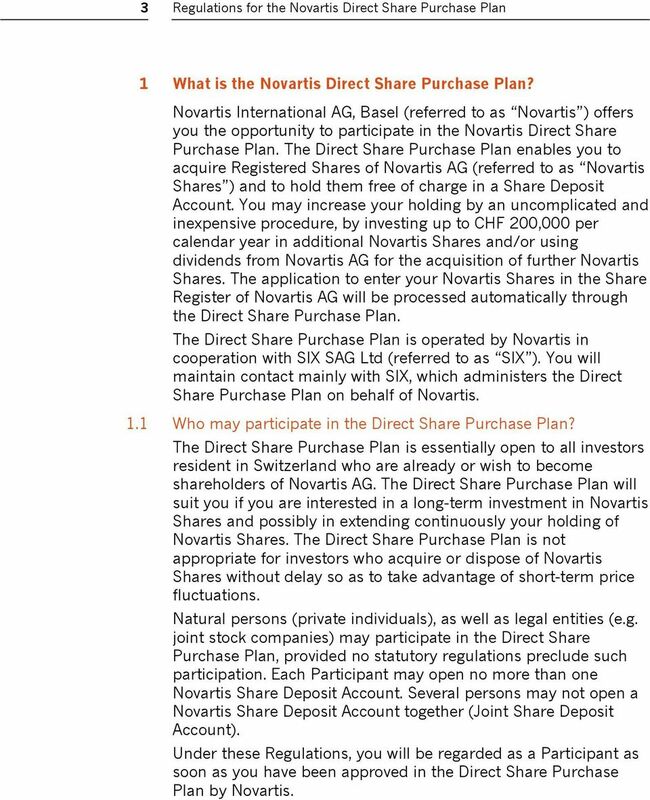 Novartis International AG, Basel (referred to as Novartis ) offers you the opportunity to participate in the Novartis Direct Share Purchase Plan. The Direct Share Purchase Plan enables you to acquire Registered Shares of Novartis AG (referred to as Novartis Shares ) and to hold them free of charge in a Share Deposit Account. You may increase your holding by an uncomplicated and inexpensive procedure, by investing up to CHF 200,000 per calendar year in additional Novartis Shares and/or using dividends from Novartis AG for the acquisition of further Novartis Shares. 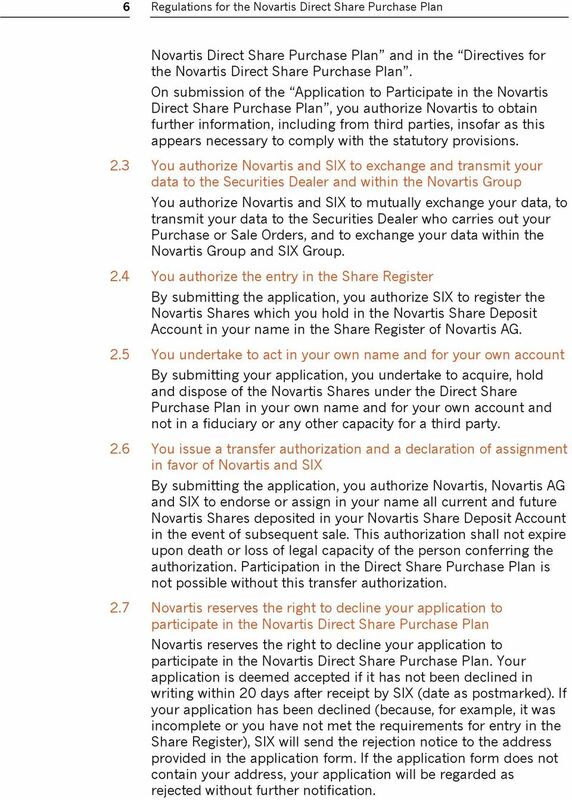 The application to enter your Novartis Shares in the Share Register of Novartis AG will be processed automatically through the Direct Share Purchase Plan. 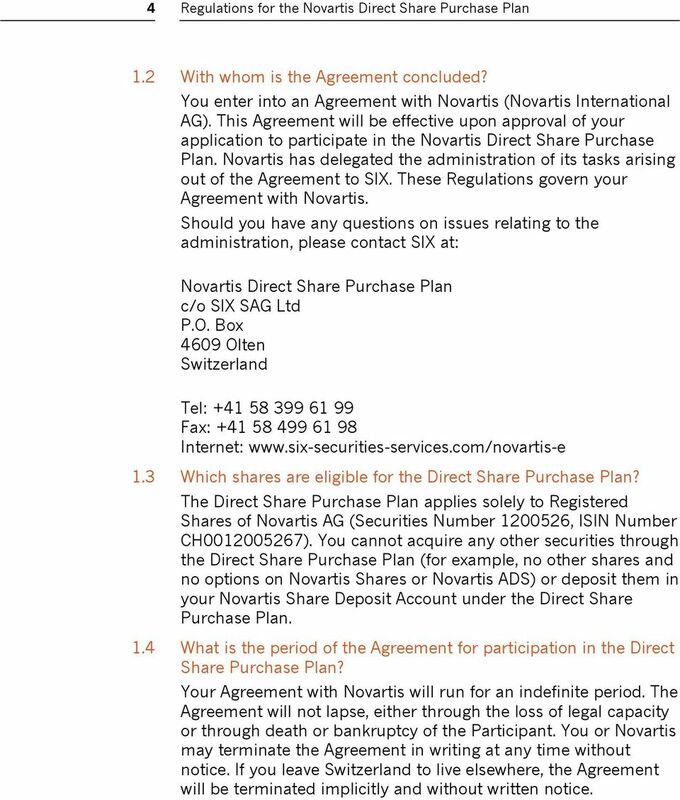 The Direct Share Purchase Plan is operated by Novartis in cooperation with SIX SAG Ltd (referred to as SIX ). You will maintain contact mainly with SIX, which administers the Direct Share Purchase Plan on behalf of Novartis. 1.1 Who may participate in the Direct Share Purchase Plan? 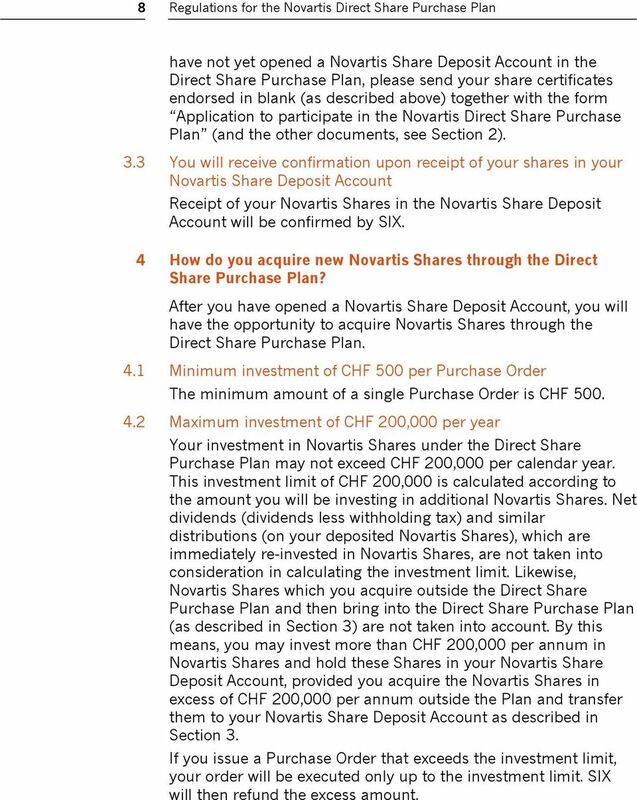 The Direct Share Purchase Plan is essentially open to all investors resident in Switzerland who are already or wish to become shareholders of Novartis AG. The Direct Share Purchase Plan will suit you if you are interested in a long-term investment in Novartis Shares and possibly in extending continuously your holding of Novartis Shares. The Direct Share Purchase Plan is not appropriate for investors who acquire or dispose of Novartis Shares without delay so as to take advantage of short-term price fluctuations. Natural persons (private individuals), as well as legal entities (e.g. joint stock companies) may participate in the Direct Share Purchase Plan, provided no statutory regulations preclude such participation. Each Participant may open no more than one Novartis Share Deposit Account. Several persons may not open a Novartis Share Deposit Account together (Joint Share Deposit Account). Under these Regulations, you will be regarded as a Participant as soon as you have been approved in the Direct Share Purchase Plan by Novartis. 6 4 Regulations for the Novartis Direct Share Purchase Plan 1.2 With whom is the Agreement concluded? You enter into an Agreement with Novartis (Novartis International AG). This Agreement will be effective upon approval of your application to participate in the Novartis Direct Share Purchase Plan. Novartis has delegated the administration of its tasks arising out of the Agreement to SIX. These Regulations govern your Agreement with Novartis. Should you have any questions on issues relating to the administration, please contact SIX at: Novartis Direct Share Purchase Plan c/o SIX SAG Ltd P.O. Box 4609 Olten Switzerland Tel: Fax: Internet: Which shares are eligible for the Direct Share Purchase Plan? The Direct Share Purchase Plan applies solely to Registered Shares of Novartis AG (Securities Number , ISIN Number CH ). You cannot acquire any other securities through the Direct Share Purchase Plan (for example, no other shares and no options on Novartis Shares or Novartis ADS) or deposit them in your Novartis Share Deposit Account under the Direct Share Purchase Plan. 1.4 What is the period of the Agreement for participation in the Direct Share Purchase Plan? Your Agreement with Novartis will run for an indefinite period. The Agreement will not lapse, either through the loss of legal capacity or through death or bankruptcy of the Participant. You or Novartis may terminate the Agreement in writing at any time without notice. If you leave Switzerland to live elsewhere, the Agreement will be terminated implicitly and without written notice. 8 6 Regulations for the Novartis Direct Share Purchase Plan Novartis Direct Share Purchase Plan and in the Directives for the Novartis Direct Share Purchase Plan. On submission of the Application to Participate in the Novartis Direct Share Purchase Plan, you authorize Novartis to obtain further information, including from third parties, insofar as this appears necessary to comply with the statutory provisions. 2.3 You authorize Novartis and SIX to exchange and transmit your data to the Securities Dealer and within the Novartis Group You authorize Novartis and SIX to mutually exchange your data, to transmit your data to the Securities Dealer who carries out your Purchase or Sale Orders, and to exchange your data within the Novartis Group and SIX Group. 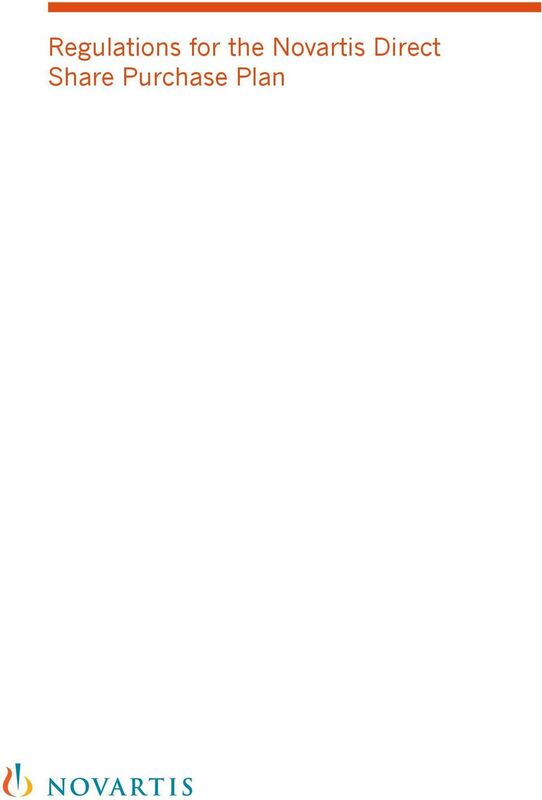 2.4 You authorize the entry in the Share Register By submitting the application, you authorize SIX to register the Novartis Shares which you hold in the Novartis Share Deposit Account in your name in the Share Register of Novartis AG. 2.5 You undertake to act in your own name and for your own account By submitting your application, you undertake to acquire, hold and dispose of the Novartis Shares under the Direct Share Purchase Plan in your own name and for your own account and not in a fiduciary or any other capacity for a third party. 2.6 You issue a transfer authorization and a declaration of assignment in favor of Novartis and SIX By submitting the application, you authorize Novartis, Novartis AG and SIX to endorse or assign in your name all current and future Novartis Shares deposited in your Novartis Share Deposit Account in the event of subsequent sale. This authorization shall not expire upon death or loss of legal capacity of the person conferring the authorization. Participation in the Direct Share Purchase Plan is not possible without this transfer authorization. 2.7 Novartis reserves the right to decline your application to participate in the Novartis Direct Share Purchase Plan Novartis reserves the right to decline your application to participate in the Novartis Direct Share Purchase Plan. Your application is deemed accepted if it has not been declined in writing within 20 days after receipt by SIX (date as postmarked). If your application has been declined (because, for example, it was incomplete or you have not met the requirements for entry in the Share Register), SIX will send the rejection notice to the address provided in the application form. If the application form does not contain your address, your application will be regarded as rejected without further notification. 10 8 Regulations for the Novartis Direct Share Purchase Plan have not yet opened a Novartis Share Deposit Account in the Direct Share Purchase Plan, please send your share certificates endorsed in blank (as described above) together with the form Application to participate in the Novartis Direct Share Purchase Plan (and the other documents, see Section 2). 3.3 You will receive confirmation upon receipt of your shares in your Novartis Share Deposit Account Receipt of your Novartis Shares in the Novartis Share Deposit Account will be confirmed by SIX. 4 How do you acquire new Novartis Shares through the Direct Share Purchase Plan? After you have opened a Novartis Share Deposit Account, you will have the opportunity to acquire Novartis Shares through the Direct Share Purchase Plan. 4.1 Minimum investment of CHF 500 per Purchase Order The minimum amount of a single Purchase Order is CHF Maximum investment of CHF 200,000 per year Your investment in Novartis Shares under the Direct Share Purchase Plan may not exceed CHF 200,000 per calendar year. This investment limit of CHF 200,000 is calculated according to the amount you will be investing in additional Novartis Shares. Net dividends (dividends less withholding tax) and similar distributions (on your deposited Novartis Shares), which are immediately re-invested in Novartis Shares, are not taken into consideration in calculating the investment limit. 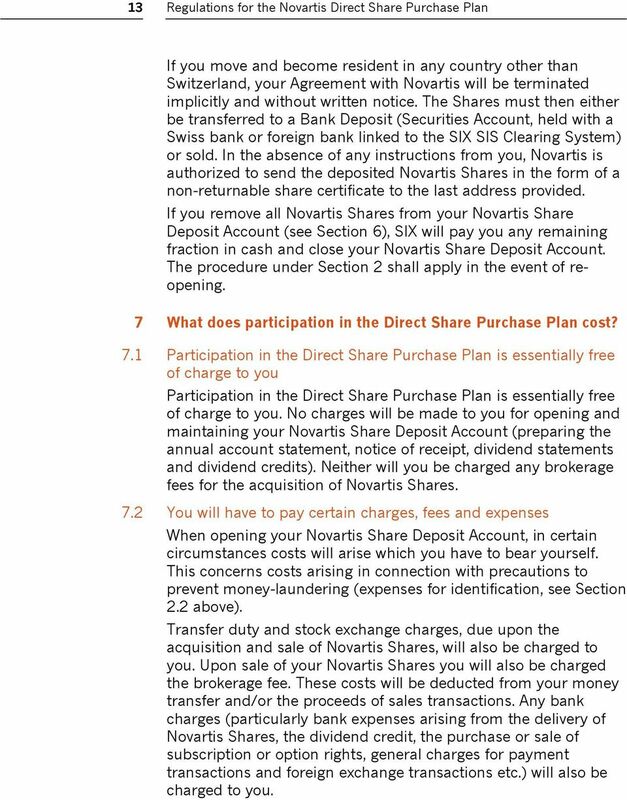 Likewise, Novartis Shares which you acquire outside the Direct Share Purchase Plan and then bring into the Direct Share Purchase Plan (as described in Section 3) are not taken into account. By this means, you may invest more than CHF 200,000 per annum in Novartis Shares and hold these Shares in your Novartis Share Deposit Account, provided you acquire the Novartis Shares in excess of CHF 200,000 per annum outside the Plan and transfer them to your Novartis Share Deposit Account as described in Section 3. If you issue a Purchase Order that exceeds the investment limit, your order will be executed only up to the investment limit. SIX will then refund the excess amount. 11 9 Regulations for the Novartis Direct Share Purchase Plan 4.3 How do you issue a Purchase Order? 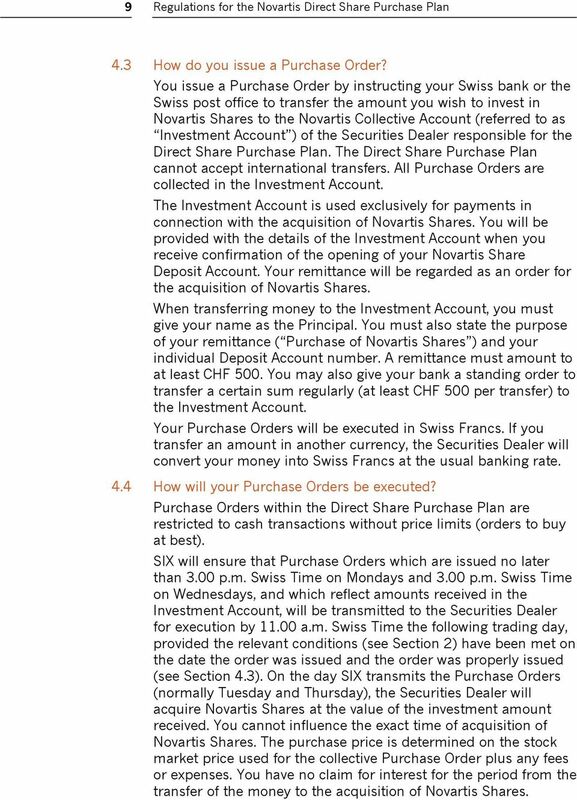 You issue a Purchase Order by instructing your Swiss bank or the Swiss post office to transfer the amount you wish to invest in Novartis Shares to the Novartis Collective Account (referred to as Investment Account ) of the Securities Dealer responsible for the Direct Share Purchase Plan. The Direct Share Purchase Plan cannot accept international transfers. All Purchase Orders are collected in the Investment Account. The Investment Account is used exclusively for payments in connection with the acquisition of Novartis Shares. You will be provided with the details of the Investment Account when you receive confirmation of the opening of your Novartis Share Deposit Account. Your remittance will be regarded as an order for the acquisition of Novartis Shares. When transferring money to the Investment Account, you must give your name as the Principal. You must also state the purpose of your remittance ( Purchase of Novartis Shares ) and your individual Deposit Account number. 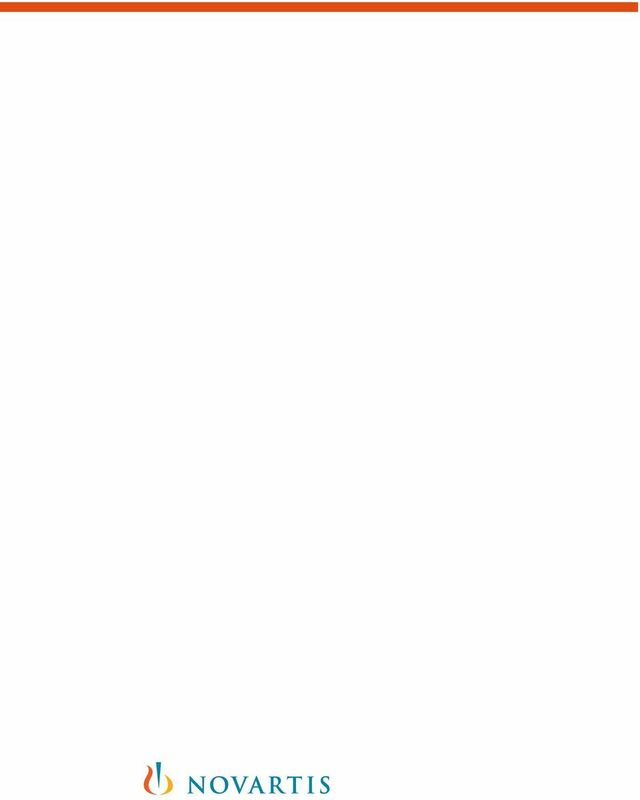 A remittance must amount to at least CHF 500. You may also give your bank a standing order to transfer a certain sum regularly (at least CHF 500 per transfer) to the Investment Account. Your Purchase Orders will be executed in Swiss Francs. If you transfer an amount in another currency, the Securities Dealer will convert your money into Swiss Francs at the usual banking rate. 4.4 How will your Purchase Orders be executed? Purchase Orders within the Direct Share Purchase Plan are restricted to cash transactions without price limits (orders to buy at best). SIX will ensure that Purchase Orders which are issued no later than 3.00 p.m. Swiss Time on Mondays and 3.00 p.m. Swiss Time on Wednesdays, and which reflect amounts received in the Investment Account, will be transmitted to the Securities Dealer for execution by a.m. Swiss Time the following trading day, provided the relevant conditions (see Section 2) have been met on the date the order was issued and the order was properly issued (see Section 4.3). On the day SIX transmits the Purchase Orders (normally Tuesday and Thursday), the Securities Dealer will acquire Novartis Shares at the value of the investment amount received. You cannot influence the exact time of acquisition of Novartis Shares. The purchase price is determined on the stock market price used for the collective Purchase Order plus any fees or expenses. You have no claim for interest for the period from the transfer of the money to the acquisition of Novartis Shares. 12 10 Regulations for the Novartis Direct Share Purchase Plan For the remaining portion of the transferred amount that is lower than the respective purchase price of one Novartis Share, a corresponding proportionate right to a Novartis Share will be booked into your Novartis Share Deposit Account (a fraction of a Novartis Share; see Section 8.1). SIX will send you a deposit account receipt and purchase note. The round number of acquired Novartis Shares will be entered into the Share Register of Novartis AG. 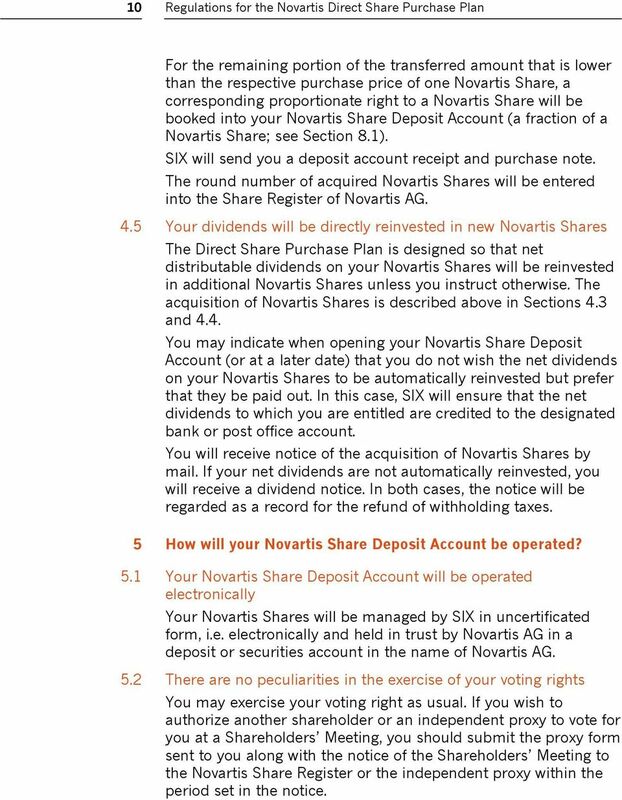 4.5 Your dividends will be directly reinvested in new Novartis Shares The Direct Share Purchase Plan is designed so that net distributable dividends on your Novartis Shares will be reinvested in additional Novartis Shares unless you instruct otherwise. The acquisition of Novartis Shares is described above in Sections 4.3 and 4.4. You may indicate when opening your Novartis Share Deposit Account (or at a later date) that you do not wish the net dividends on your Novartis Shares to be automatically reinvested but prefer that they be paid out. In this case, SIX will ensure that the net dividends to which you are entitled are credited to the designated bank or post office account. You will receive notice of the acquisition of Novartis Shares by mail. If your net dividends are not automatically reinvested, you will receive a dividend notice. In both cases, the notice will be regarded as a record for the refund of withholding taxes. 5 How will your Novartis Share Deposit Account be operated? 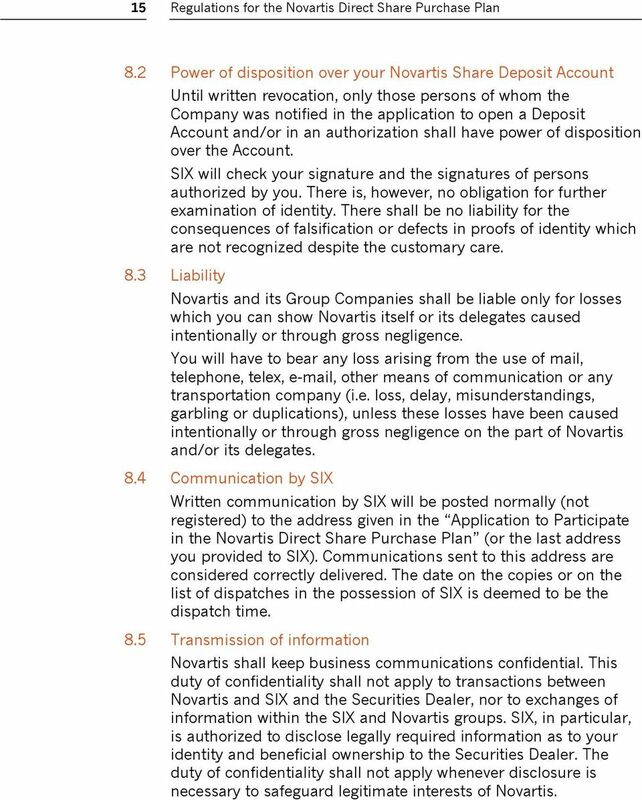 5.1 Your Novartis Share Deposit Account will be operated electronically Your Novartis Shares will be managed by SIX in uncertificated form, i.e. electronically and held in trust by Novartis AG in a deposit or securities account in the name of Novartis AG. 5.2 There are no peculiarities in the exercise of your voting rights You may exercise your voting right as usual. If you wish to authorize another shareholder or an independent proxy to vote for you at a Shareholders Meeting, you should submit the proxy form sent to you along with the notice of the Shareholders Meeting to the Novartis Share Register or the independent proxy within the period set in the notice. 14 12 Regulations for the Novartis Direct Share Purchase Plan deduction of brokerage fees, transaction fees, stock market charges and the contribution to expenses required by SIX, will be credited to your bank or post office account. The net sale proceeds will be credited in accordance with the rules of the Swiss Stock Exchange, whereby additional value days may occur as a consequence of your account instructions. Any loss of interest must be borne by you. As soon as your Novartis Shares have been sold, you will receive a sales statement from SIX. 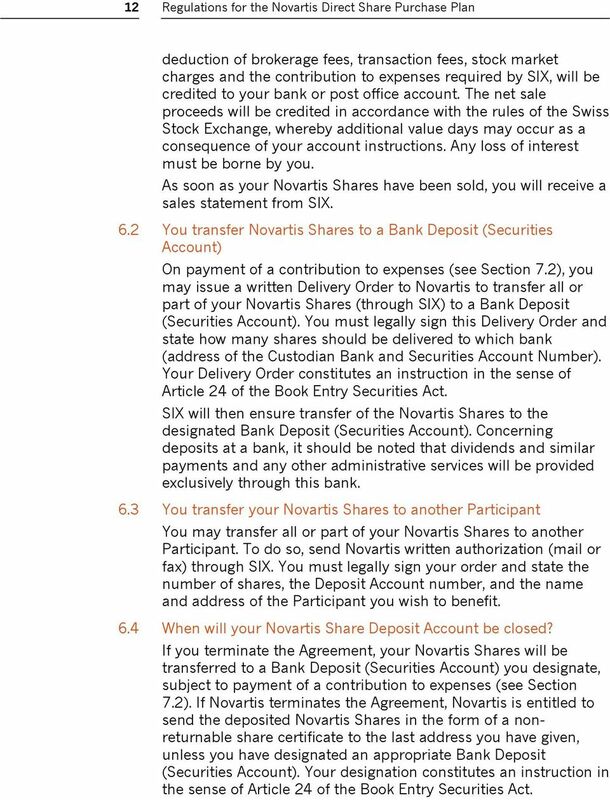 6.2 You transfer Novartis Shares to a Bank Deposit (Securities Account) On payment of a contribution to expenses (see Section 7.2), you may issue a written Delivery Order to Novartis to transfer all or part of your Novartis Shares (through SIX) to a Bank Deposit (Securities Account). You must legally sign this Delivery Order and state how many shares should be delivered to which bank (address of the Custodian Bank and Securities Account Number). Your Delivery Order constitutes an instruction in the sense of Article 24 of the Book Entry Securities Act. SIX will then ensure transfer of the Novartis Shares to the designated Bank Deposit (Securities Account). Concerning deposits at a bank, it should be noted that dividends and similar payments and any other administrative services will be provided exclusively through this bank. 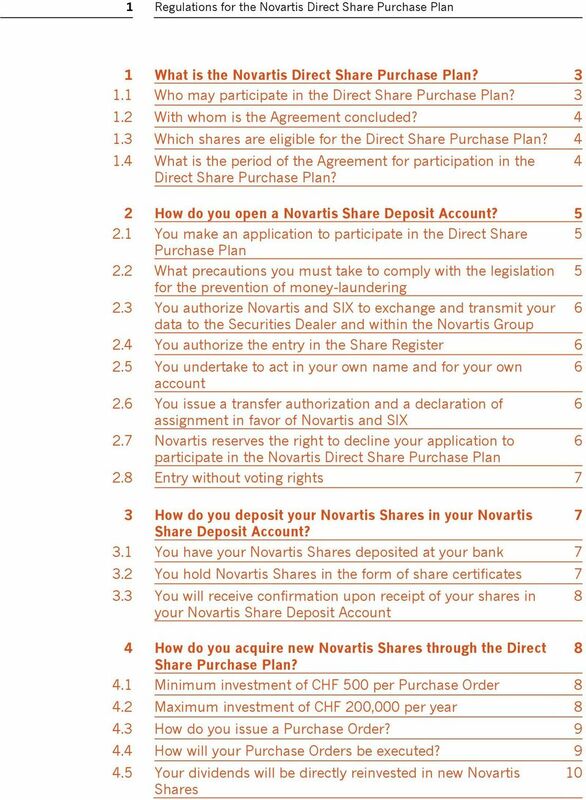 6.3 You transfer your Novartis Shares to another Participant You may transfer all or part of your Novartis Shares to another Participant. To do so, send Novartis written authorization (mail or fax) through SIX. You must legally sign your order and state the number of shares, the Deposit Account number, and the name and address of the Participant you wish to benefit. 6.4 When will your Novartis Share Deposit Account be closed? If you terminate the Agreement, your Novartis Shares will be transferred to a Bank Deposit (Securities Account) you designate, subject to payment of a contribution to expenses (see Section 7.2). If Novartis terminates the Agreement, Novartis is entitled to send the deposited Novartis Shares in the form of a nonreturnable share certificate to the last address you have given, unless you have designated an appropriate Bank Deposit (Securities Account). Your designation constitutes an instruction in the sense of Article 24 of the Book Entry Securities Act. 15 13 Regulations for the Novartis Direct Share Purchase Plan If you move and become resident in any country other than Switzerland, your Agreement with Novartis will be terminated implicitly and without written notice. The Shares must then either be transferred to a Bank Deposit (Securities Account, held with a Swiss bank or foreign bank linked to the SIX SIS Clearing System) or sold. 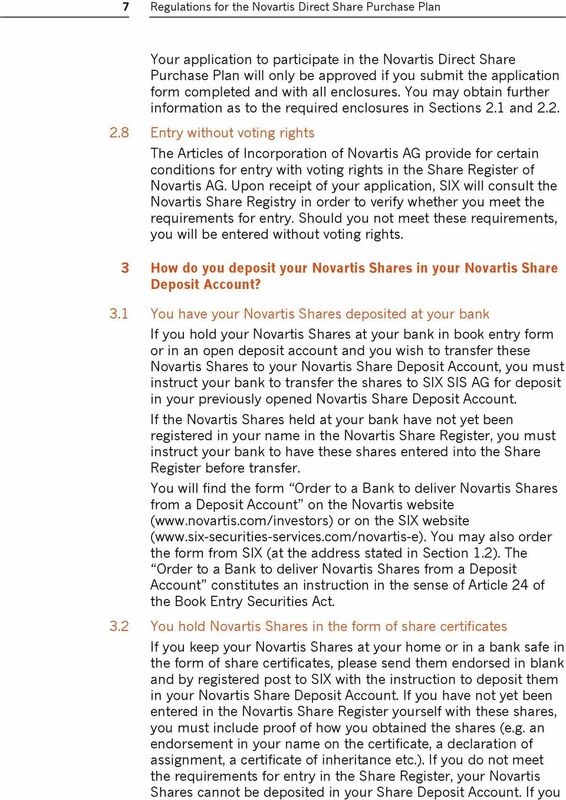 In the absence of any instructions from you, Novartis is authorized to send the deposited Novartis Shares in the form of a non-returnable share certificate to the last address provided. 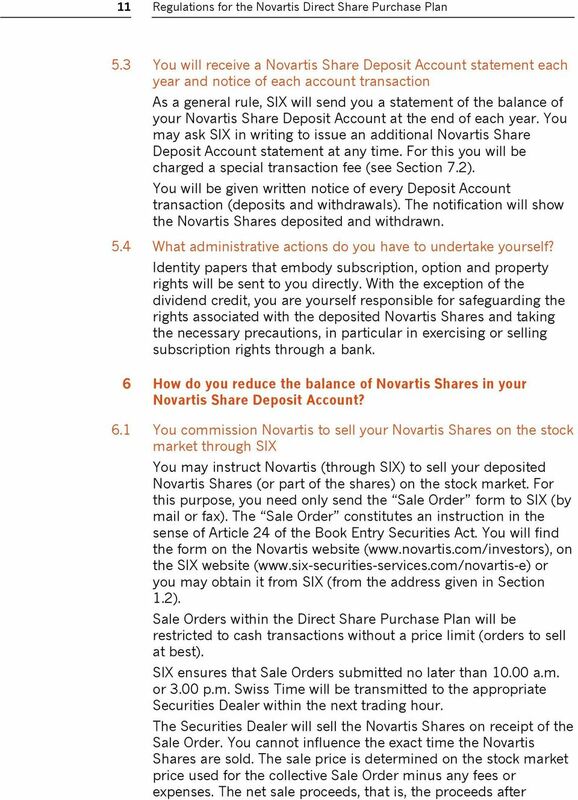 If you remove all Novartis Shares from your Novartis Share Deposit Account (see Section 6), SIX will pay you any remaining fraction in cash and close your Novartis Share Deposit Account. The procedure under Section 2 shall apply in the event of reopening. 7 What does participation in the Direct Share Purchase Plan cost? 7.1 Participation in the Direct Share Purchase Plan is essentially free of charge to you Participation in the Direct Share Purchase Plan is essentially free of charge to you. No charges will be made to you for opening and maintaining your Novartis Share Deposit Account (preparing the annual account statement, notice of receipt, dividend statements and dividend credits). Neither will you be charged any brokerage fees for the acquisition of Novartis Shares. 7.2 You will have to pay certain charges, fees and expenses When opening your Novartis Share Deposit Account, in certain circumstances costs will arise which you have to bear yourself. This concerns costs arising in connection with precautions to prevent money-laundering (expenses for identification, see Section 2.2 above). Transfer duty and stock exchange charges, due upon the acquisition and sale of Novartis Shares, will also be charged to you. Upon sale of your Novartis Shares you will also be charged the brokerage fee. These costs will be deducted from your money transfer and/or the proceeds of sales transactions. Any bank charges (particularly bank expenses arising from the delivery of Novartis Shares, the dividend credit, the purchase or sale of subscription or option rights, general charges for payment transactions and foreign exchange transactions etc.) will also be charged to you. 16 14 Regulations for the Novartis Direct Share Purchase Plan When Novartis Shares are delivered from your Novartis Share Deposit Account (or when it is closed) or if you request an additional account statement, Novartis will charge a contribution to expenses. You must settle this contribution to expenses in advance by payment to Novartis (through SIX). On a sale of deposited Novartis Shares, Novartis also requires a contribution to expenses. This will, however, be deducted directly from the sale proceeds. 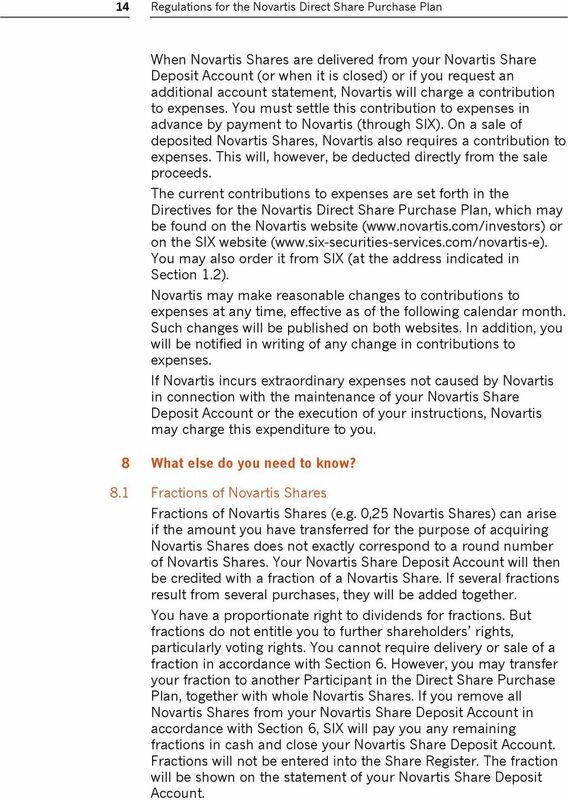 The current contributions to expenses are set forth in the Directives for the Novartis Direct Share Purchase Plan, which may be found on the Novartis website ( or on the SIX website ( You may also order it from SIX (at the address indicated in Section 1.2). Novartis may make reasonable changes to contributions to expenses at any time, effective as of the following calendar month. Such changes will be published on both websites. In addition, you will be notified in writing of any change in contributions to expenses. If Novartis incurs extraordinary expenses not caused by Novartis in connection with the maintenance of your Novartis Share Deposit Account or the execution of your instructions, Novartis may charge this expenditure to you. 8 What else do you need to know? 8.1 Fractions of Novartis Shares Fractions of Novartis Shares (e.g. 0,25 Novartis Shares) can arise if the amount you have transferred for the purpose of acquiring Novartis Shares does not exactly correspond to a round number of Novartis Shares. Your Novartis Share Deposit Account will then be credited with a fraction of a Novartis Share. If several fractions result from several purchases, they will be added together. You have a proportionate right to dividends for fractions. But fractions do not entitle you to further shareholders rights, particularly voting rights. You cannot require delivery or sale of a fraction in accordance with Section 6. However, you may transfer your fraction to another Participant in the Direct Share Purchase Plan, together with whole Novartis Shares. 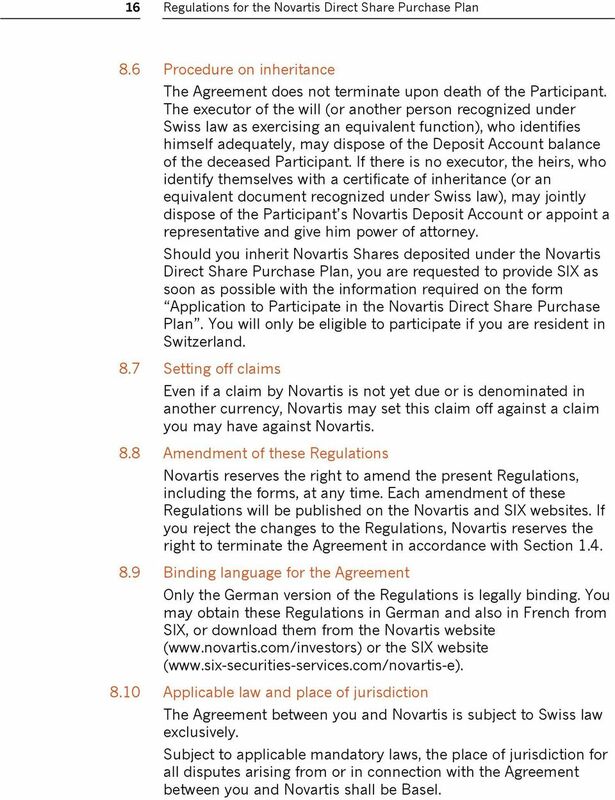 If you remove all Novartis Shares from your Novartis Share Deposit Account in accordance with Section 6, SIX will pay you any remaining fractions in cash and close your Novartis Share Deposit Account. Fractions will not be entered into the Share Register. The fraction will be shown on the statement of your Novartis Share Deposit Account. 17 15 Regulations for the Novartis Direct Share Purchase Plan 8.2 Power of disposition over your Novartis Share Deposit Account Until written revocation, only those persons of whom the Company was notified in the application to open a Deposit Account and/or in an authorization shall have power of disposition over the Account. SIX will check your signature and the signatures of persons authorized by you. There is, however, no obligation for further examination of identity. There shall be no liability for the consequences of falsification or defects in proofs of identity which are not recognized despite the customary care. 8.3 Liability Novartis and its Group Companies shall be liable only for losses which you can show Novartis itself or its delegates caused intentionally or through gross negligence. You will have to bear any loss arising from the use of mail, telephone, telex, , other means of communication or any transportation company (i.e. loss, delay, misunderstandings, garbling or duplications), unless these losses have been caused intentionally or through gross negligence on the part of Novartis and/or its delegates. 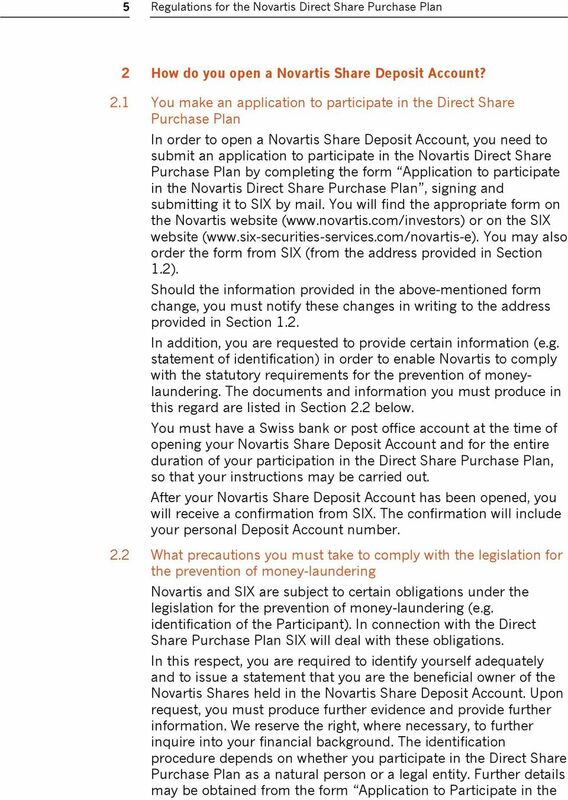 8.4 Communication by SIX Written communication by SIX will be posted normally (not registered) to the address given in the Application to Participate in the Novartis Direct Share Purchase Plan (or the last address you provided to SIX). Communications sent to this address are considered correctly delivered. The date on the copies or on the list of dispatches in the possession of SIX is deemed to be the dispatch time. 8.5 Transmission of information Novartis shall keep business communications confidential. This duty of confidentiality shall not apply to transactions between Novartis and SIX and the Securities Dealer, nor to exchanges of information within the SIX and Novartis groups. SIX, in particular, is authorized to disclose legally required information as to your identity and beneficial ownership to the Securities Dealer. The duty of confidentiality shall not apply whenever disclosure is necessary to safeguard legitimate interests of Novartis. 18 16 Regulations for the Novartis Direct Share Purchase Plan 8.6 Procedure on inheritance The Agreement does not terminate upon death of the Participant. The executor of the will (or another person recognized under Swiss law as exercising an equivalent function), who identifies himself adequately, may dispose of the Deposit Account balance of the deceased Participant. If there is no executor, the heirs, who identify themselves with a certificate of inheritance (or an equivalent document recognized under Swiss law), may jointly dispose of the Participant s Novartis Deposit Account or appoint a representative and give him power of attorney. 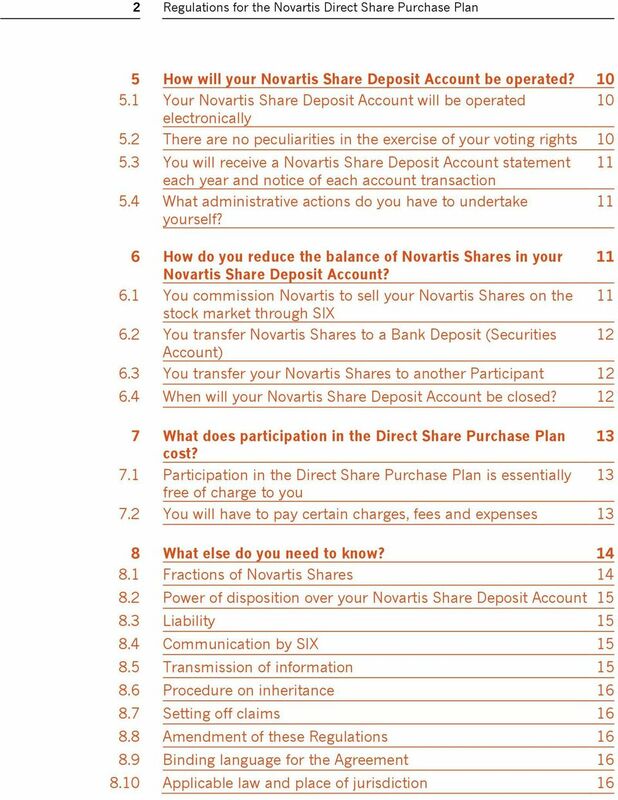 Should you inherit Novartis Shares deposited under the Novartis Direct Share Purchase Plan, you are requested to provide SIX as soon as possible with the information required on the form Application to Participate in the Novartis Direct Share Purchase Plan. You will only be eligible to participate if you are resident in Switzerland. 8.7 Setting off claims Even if a claim by Novartis is not yet due or is denominated in another currency, Novartis may set this claim off against a claim you may have against Novartis. 8.8 Amendment of these Regulations Novartis reserves the right to amend the present Regulations, including the forms, at any time. Each amendment of these Regulations will be published on the Novartis and SIX websites. If you reject the changes to the Regulations, Novartis reserves the right to terminate the Agreement in accordance with Section Binding language for the Agreement Only the German version of the Regulations is legally binding. You may obtain these Regulations in German and also in French from SIX, or download them from the Novartis website ( or the SIX website ( Applicable law and place of jurisdiction The Agreement between you and Novartis is subject to Swiss law exclusively. 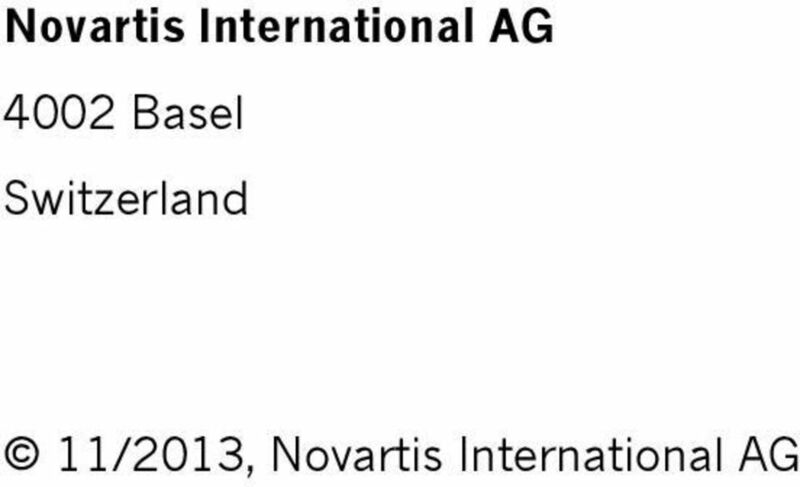 Subject to applicable mandatory laws, the place of jurisdiction for all disputes arising from or in connection with the Agreement between you and Novartis shall be Basel. THIS DOCUMENT CONSTITUTES PART OF A PROSPECTUS COVERING SECURITIES THAT HAVE BEEN REGISTERED UNDER THE SECURITIES ACT OF 1933. PM975d Deluxe Corporation Employee Stock Purchase Plan Summary and Prospectus THIS DOCUMENT CONSTITUTES PART OF A PROSPECTUS COVERING SECURITIES THAT HAVE BEEN REGISTERED UNDER THE SECURITIES ACT OF 1933.